How to integrate technology in B2B marketing strategy? How can a bot not only help you to improve your communication, but also to boost conversion and to acquire rich data? How to set up a bot in a B2B environment and what would be the budget framework? Stefan works as growth and innovation strategist at Upthrust and provide consulting workshops at The House of Marketing where he guides companies on the road towards customer centric product, services and UX design, based on the principles of the Business Design, Thinking Agile and lean start-ups. In the past he has helped already quite some ventures, both B2B and B2C and from start-ups to blue chips like Electrabel, Securex, AkzoNobel, Nutriad, De Persgroep, ARAG, Colgate Palmolive, ALD Automative, Veritas, CP Company, ZEB, Johnson&Johnson, Butch Tailors, …. Stefan has a background in Economics, completed with a post-master in General Management at Vlerick Business School. He has a passion for creating brands, products and user experiences that matter, while continuously challenging the status quo. He has helped numerous companies transforming and achieving their marketing and innovation goals and loves to share his vision and tips during keynotes. How AI will boost innovation in B2B? Kevin is the co-founder and CEO of Sagacify, a company developing innovative products using artificial intelligence. Following graduation from UCLouvain with a Master in Computer Science and Statistics in 2007, he realised the potential that Machine Learning could bring to the industry and got infected by the AI virus. He then started a PhD in Semi-Supervised Learning at the same university. At the same time, he co-founded Sagacify, convinced that artificial intelligence was going to be a tremendous drive of changes in the industry where mundane and repetitive tasks humans have to take care of today will be safely delegated to machines, leaving us with more time to innovate, create and enjoy our lives. 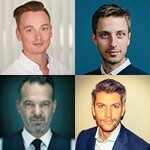 Focus content: How AI will boost innovation in B2B? On a constant and neverlasting quest for more relevant Marketing, intrigued by new paradigms dicated by new customer behaviour. Ted Talk junky in the morning, Growth architect & Marketing Automation aficionado during the day. DJ at night. Father of 5 all the time. Started off his career at Hewlett Packard and Dell in various Sales & Marketing roles on EMEA level; one of the first employees of Salesforce.com in Belgium and one of the team members at Showpad. Mentor at KBC start it and head of Martech for one of the biggest incubators in Belgium – Crosspoint Solutions. But now active as founder of GrowthAgent. guiding them towards the realization of their ambitions, taking on challenges and transforming companies. Aside from his consulting-work, Sven is a respected teacher and guest-speaker at several institutes and national & international conferences.